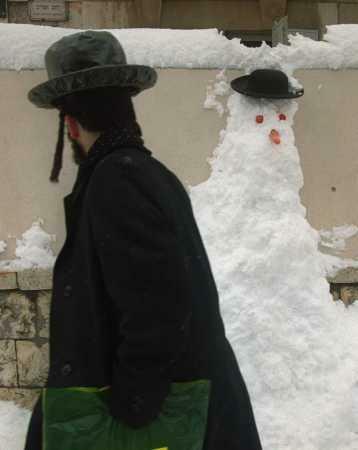 I am writing this blog on a day when Jerusalem is "snowed in". I do not live in Jerusalem but I live close enough that I can see it from my window. All I can see is a thin layer of snow on top of some mountains. I have seen the many photos posted on the news, including videos, and to be honest, I have not seen any photos where the snow is higher than anyone's shoes. Now I do not mean to belittle the severity of the storm, but having been to Michigan, Norway, and Germany in winter, well…I have a different perspective. Or, in Germany, where my first words in German were, viel Schnee, sehr kalt, much snow, very cold. Now in all those places business and life went on as usual, despite the snow and cold, but here in Jerusalem life has come to a standstill. Schools are closed, most work places are closed, there is no public transportation and both entrances to Jerusalem are closed to all traffic. Now the point is that Israelis do not know how to handle these types of situations, lets be honest. A little bit of snow and everyone freaks out. We are not prepared and we don't have the tools to handle these situations, so we just shut down. On the other hand Israel is a leader in many areas, such as Search and Rescue, Counter Terrorism and Krav Maga self defense. The point I am trying to make is rather simple; for each nation and for each individual we must recognize the strengths and weaknesses. You want to learn Krav Maga? Come to Israel. You want to learn how to cope with snow? Find another country, it ain't us. Security, safety, hand to hand combat. Learn from the inside what it is all about. Read the book and come to Israel for Tour and Train. Tour and Train in Israel. Join the most exciting program; train in all aspects of Krav Maga, (option for instructor testing), see the country, learn the heritage, taste the food and float in the Dead Sea. Experience Counter-Terrorism training from Israel's best. Learn how Israelis handle hostage situations, defense in and around a car, fight on the stairs. Open to beginners and advanced instructors. We have trained people with no previous experience and those who have fought in the best units in the world, and every level in between. This is suitable for anyone in good health with an open mind and a strong desire to learn. Next sessions: June 10, 2013, November 2013. Limited space, reserve your spot now.